Will EUR/USD Test Its 2011 Low? Thanks to the euro zone debt drama, EUR/USD is edging closer and closer to its 2011 low. The daily chart shows that the 1.3200 major psychological support level is holding for now. But for how long? 1. More rating downgrades on the horizon? The euro was already off to a poor start this week as credit rating agency Moody’s announced that it will review the debt ratings of ALL European countries. According to Moody’s, EU member countries are still prone to further shocks. Most market participants probably had goosebumps just thinking about the possible impact of rating downgrades on borrowing costs and liquidity in the region! A few days ago, the ECB cut rates by 25 basis points in order to boost liquidity in the euro zone. Although this monetary policy move was widely expected, many were surprised when ECB head Mario Draghi downplayed the role of the central bank in dealing with the ongoing debt crisis. Draghi even announced that the bond-buying would have to stop for now and that the ECB wouldn’t funnel extra funds to cash-strapped nations through the IMF. So much for being the lender of last resort! As I mentioned in my recent EU Summit entry, most traders didn’t seem to be pleased with the outcome of the European leaders’ meeting. Instead of coming up with a convincing solution to keep the debt crisis contained, they simply drafted a bunch of budget rules which ended up being rejected by the U.K. If you remember, the euro initially rallied at the release of the EU Summit details, suggesting that there are still some investors out there who aren’t in a hurry to dump their euros. After all, the European leaders did accomplish something other than a pretty group photo. Aside from the 26 out of 27 nations committing to trim their budget deficit, the launch of the European Stability Mechanism (ESM), a replacement of the EFSF, is now bumped up to 2012 instead of 2013. In addition, a total of 200 billion EUR was also handed out to the IMF to be distributed to the euro zone states should a need arise. For some investors, a lil’ somethin’ is better than nothing. Another possible reason for a EUR/USD bounce is the impact of the six central banks’ recent intervention. A few weeks ago the Fed, ECB, BOC, BOE, SNB, and BOJ all cut their dollar swap rates by 50 basis points, making borrowing for European banks a bit cheaper. The decision has only been valid since last week, so there’s still plenty of time for the markets to price in the decision’s impact. The last but definitely not the least reason why EUR/USD could still rise is the possibility of a “Santa Claus rally” that I wrote about before. For some reason, EUR/USD tends to rally by as much as 300 pips near the end of a year until early next year. Who knows, maybe we’ll see another one this year! Since the euro zone debt crisis has been dominating risk sentiment for the past couple of weeks (heck, months! ), it’s likely that it will continue to dictate risk appetite for the remaining weeks of the year. Whether you’re bullish or bearish on EUR/USD or even when you’re trading other major currencies, make sure you keep your head in the game by always being updated on the latest fundamental news. My personal choice would be reading Pip Diddy’s Daily Forex Fundamentals, but you can also check out the FX-men’s Twitter and Facebook accounts if you have any questions. 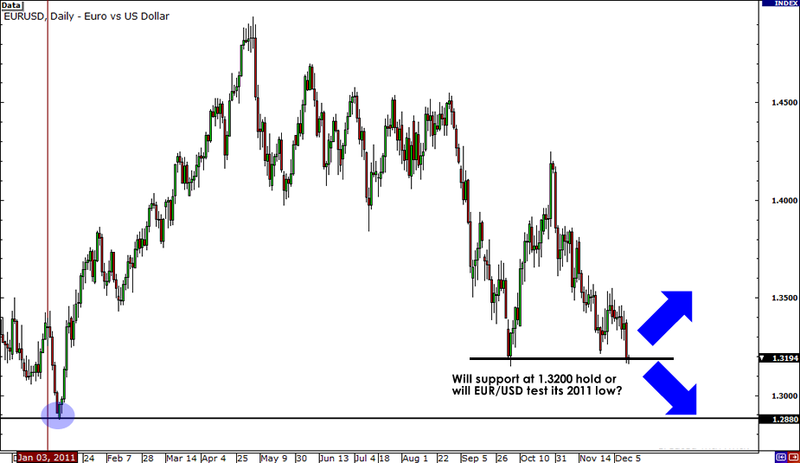 Will support at 1.3200 hold or will EUR/USD test its 2011 low?